Our product team has been continuously working on features that could be useful for your organization. Here are 3 that we launched this week. 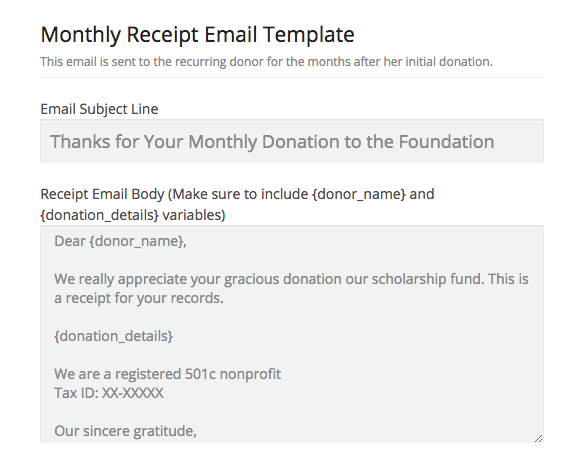 After charging your recurring donors each month, Donorbox sends them a donation receipt. You can now customize the content of these email receipts. This is a great place to thank your recurring supporters and to add your tax-id info. To get to these settings please go to Account > Receipt Email Settings. In your donations csv export, we’ve added the processing fee as well as the net donation amount values. For organizations that use our hosted donation page, we’ve spruced up our donate button a bit. Using our button creator, you can customize the donation button in any color that you like. We are working hard on adding a test donation mode and better stats for your dashboard. If you have any suggestions please drop us a line at support[at]donorbox.org.